This summer, I will focus on a blog series where I share how I’ve designed, organized and implemented a successful intervention program. This won’t be a lesson on the RTI model with triangles and tiers. This will be a personal story about my passion for teaching students that just need a little help to be successful. Maybe there are other intervention teachers looking for ideas, or maybe there are leaders thinking about redesigning a school’s intervention system. Maybe I’ll hear from other intervention teachers that I can learn from. As my leadership team prepared for the 2013-2014 school year, we had a huge task ahead of us. For a variety of reasons, we had been tasked with surveying the staff and developing and committing to a variety of change. While that was happening, our principal and vice principal knew they would not be returning. I was tasked to be the point person for gathering all the feedback and organizing it. I also was tasked with presenting the results to our superintendent. This was, as I’m sure you can imagine, or have experienced, a stressful time. One of the easy decisions was to commit to being a STEM school. As discussions were taking place, one thing became clear. We needed to work on our RTI plan. I have to stop here and tell you that I work with amazing people. I’ve been at my school for more than ten years. During that time we’ve had several principals come and go and other challenges. Through it all we’ve been a family. Sometimes you have nothing but love for your family, sometimes you disagree or drive each other nuts, but you always have each others back. Some of our family members moved on to other schools, but they are still part of us. The teachers I work with are dedicated to our kids and their future. Our kids. They will always be our kids. I can’t look up our stats on the internet because our population changes much more often than those numbers do. We are a K-6 elementary school who has about 580 students. Well, next year we’ll be TK-6th. We are one of the only elementary schools in the district that has 6th grade. We’ve fought to keep that option. We want as many years as possible to help get these kids on grade level before they get tracked in Middle School or get pulled into gang activity. Our students are about 80% English Language Learners and about 75% Free or Reduced Lunch. Most of our students speak Spanish at home and English at school. Some of our families are migrant farm workers and some students have to move from school to school. Many of their parents didn’t have the luxury of finishing high school, or some even elementary. Their parents work long and hard to feed them and trust us to take care of educating them. We looked at what we had that was working. We had a Read 180 teacher that pulled kids for a replacement reading class that took place during 4-6 reading. We had flexible Sped teachers that pushed in or pulled out based on needs and IEPs. Our teachers love departmentalizing. Each grade has 3 teachers. In the upper grades, there is a reading teacher, a math teacher, and a STEM teacher. Collaboration is key to our success. Our grade level teams collaborate daily while students attend specials. They go through the data teams process together and discuss solutions for concerns. We looked at what was a challenge. Our other interventions changed year to year. 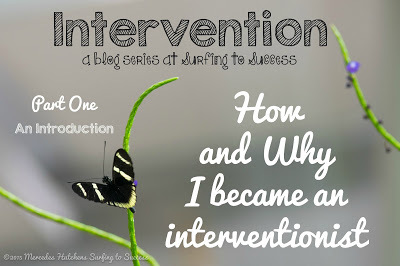 Often, we didn’t know if we would have an intervention teacher until the school year started. Sometimes they were hired a few months in. They were usually new teachers and our system was to tell them to ask the teachers what they wanted. Often the schedules between grade levels didn’t gel and there would be chunks of time where no kids were available or grade levels had to settle for less than ideal conditions. Sometimes kids would be pulled from reading for math tutoring or vice versa. If they were pulled from math for math, they ended up missing core lessons. Teachers were feeling overwhelmed. There just wasn’t enough time in the day for them to teach everything and have effective intervention. Then, we thought about what we wanted. We wanted consistency. We wanted structure. We wanted intervention to be a priority. We wanted all students to get all the classroom content AND intervention. In the end we rearranged our school schedule into 45 minute blocks. This way, all subjects would start and stop at similar times. This built in flexibility. If teachers and families found the need to have students go up or down a grade for one subject, it would be possible. We decided that the intervention position needed to be consistent. We felt like it was too much to ask a new teacher to communicate with 21 homeroom teachers and teach several grade levels. We also had Americorp start to work with us and wanted it to be better connected to our needs. So, we decided we needed our intervention teacher to be an experienced member of our leadership team who would coordinate all interventions that were taking place. We rearranged things so that the Intervention Coordinator would lead the specials team. Intervention would now take place during specials. We wanted short term, flexible grouping that would not cause students to miss core subject time. I know there is a lot of debate about push in or pull out intervention. Our teachers decided on pull out intervention. It is what works for us. Much of what I’ll blog about in this series will work for either model or a combination model. While I felt a little crazy agreeing to take such a challenging assignment, I’m so glad I did. I feel like I was made for this position. I’ve been teaching since 1997. I’ve taught K-5th grade as a homeroom during that time. I was a long term sub in 4th, then 2nd, then Kinder my first year teaching. Then I taught 1st grade at a Catholic School for a few years (with classes of 40 kids!). When I came to my current school, I spent a few years in 3rd, then 1st and then most of my time in second. Then, I jumped to 5th grade math. Most of that time I’ve been on the leadership team. During that time I also was a trainer for two reading programs (SFA and Fundations). I spent time traveling and training teachers how to teach reading. I’ve been a support provider for several new teachers as they clear their credentials through our induction program. Even though it is a lot of time, I agree to do it time and time again because I care about our kids and want to help their teachers be their best. I’ve always secretly loved THOSE kids, the most challenging ones, the ones that keep teachers up at night. I love helping them. I love teaching them. Not just teaching them content, but teaching them how to be a productive member of the classroom. I love the aha moment. I love seeing the progress students make. I love seeing them have moments of success that build confidence. As I go through this series, I’ll explain more about what I do as an Interventionist, but here it is in a nutshell. When students go to specials, some of them come to me for 40 minutes. I see seven grades a day. 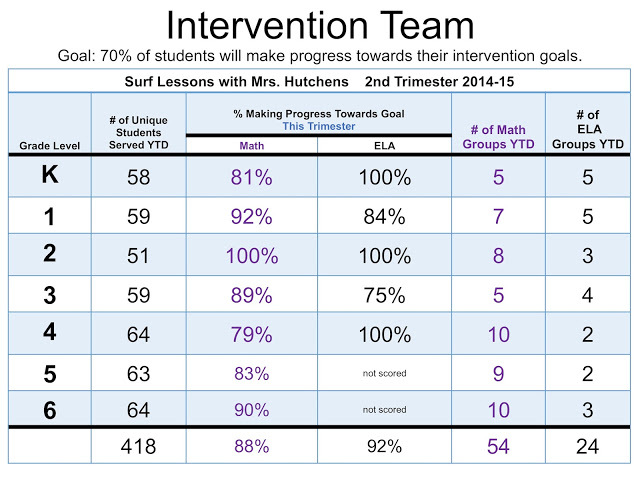 Teachers look at their data as a team and refer students to me. The teachers decide what I’ll teach and for how long. I gather and create resources and assessments. I let the students know our objective when they first arrive and I let them know the success criteria. Some students work to prove to me right away that they’ve met the success criteria. Some students beg to stay even once they’ve proven they can meet our objective. I let them. If they want to miss art or PE to divide, how can I say no? In the title, I used the word SUCCESSFUL. I believe all students can succeed. I’ve spent the last few years working hard to make sure what I’m doing is helping my students be successful learners. 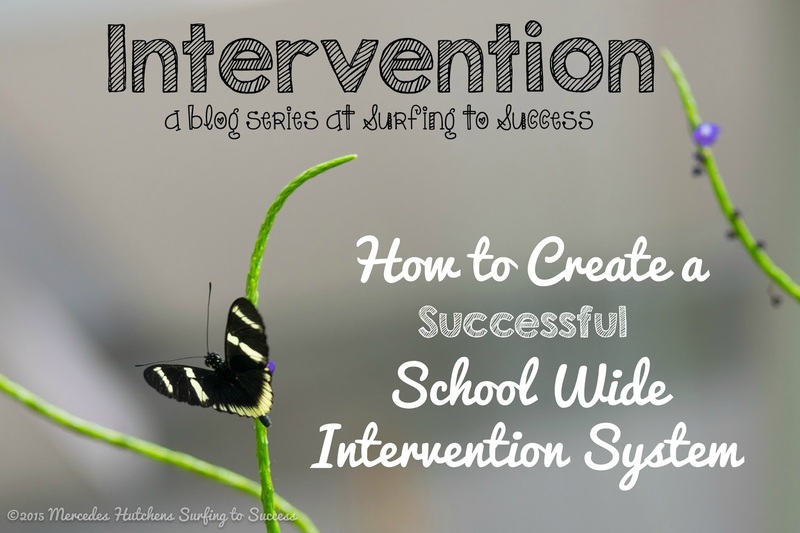 I’ve been able to create a successful school wide intervention system. I hope you’ll come back my blog and read about how you can too. If you are like me, you are wondering about the validity of my claim. At our school, we have a Shout Out periodically to let everyone know what we are up to. 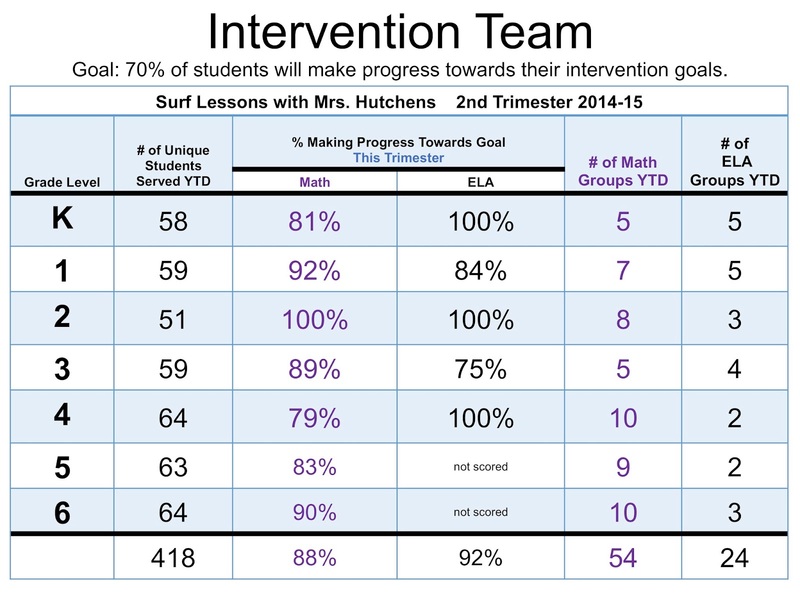 I thought I’d share my slide from March as an example of how our intervention system has been successful in helping our kids. As this series goes on, I’ll share some stories as well. This year I taught 418 out of 580 kids. Some of those kids saw me once. Many of them saw me several times. My group sizes ranged from 5 to 28 but averaged around 15. How progress is measured varies based on referrals from the teachers. I’d be lying if I said I’m happy with 88% and 92%. Really, I want 100%. Luckily, I’ll see most of those kids next year and I’ll keep tweaking what I’m doing until I find what works for those few. I love that we have a system that allows all kinds of learners to get the help they need. When we can identify one specific need and give kids the opportunity to fill that gap, that success can trickle into the rest of their learning. I work to not only meet the needs the specific academic goals but to foster a love of learning and a belief that they can be successful. With a clear goal, and a little help, everyone can succeed. I hope you’ll come back for Part Two: The Referral Process. Be sure to follow me on Bloglovin’ or Facebook so you don’t miss out.